If you're ordering a bin and are aware of the rain chances, ask your sales representative to add to your order a couple of extra boards under the bin so it will sit at a slant to allow the water to seep out the back doors. Pleases be aware that anything mixed with the water can pour out onto your driveway and may cause staining or damages. Tarps are another good preventative for rainwater and from the possibility of others dumping their trash into your bin. Our dimensions can be found on our website, or you can call or email the sales representative at any time to get assistance with them. We recommend, when buying a tarp, to buy one a couple of feet larger than the bin and buying one with grommets. The least expensive tarp that we have personally shopped for was at our local Wal-Mart; other possibilities of finding tarps may be at your local hardware stores. There is debris that is considered very porous and will absorb the rainwater causing the bin to be even heavier than it would be if the debris were dry. Some of the debris considered porous are carpet, mattresses, clothing, paper, sheet rock, etc. Covering the bin with a tarp would be the best suggestion for debris of this sort because the items are so porous, tilting the bin would not make a difference since the rainwater is being absorbed. BTDT San Antonio is here to help our customers in any way we possibly can. Do not hesitate to contact our office with any questions or concerns at 210-441-2121. Beat the Holiday Rush! It's the most wonderful time of the year to focus on your calendar and your reminder notes to remember gifts, parties, events and even your dumpster rentals! Please make sure to make all arrangements with the office for your bins are made before these dates to avoid any Inactivity Fees or Rental Rates. Christmas is one of the most time-honored and cherished holidays in the world, and the Christmas tree is the centerpiece of every Christmas celebration. Below are some reminders of Fire safety tips for your Christmas Tree. Back To School The back-to-school season is upon us. Which means summer is coming to an end. There is still time to complete that summer home clean out that you've been pushing off. 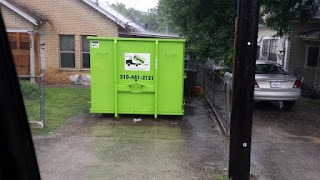 Clean out your child's closets,throw out old clothes, old furniture, toys, landscape items, or general junk and trash that you have around the house.Give us a call to order one of our dumpsters, we can usually get you on schedule for a next day delivery.